◆WIDER SOLAR PANEL & BRIGHTER: Our solar string lights use WIDER solar panel provide the fastest possible charging, fully charged about 6-8 hours, and larger capacity which can release more energy, making string lights brighter. Each strand is wired to an individual solar panel. ◆LONG LASTING TIME: Ensure they had full sun all day, string lights will automatically light up at night and stay on till dawn when they automatically shut off. Ideal for home indoor outdoor decorations. ◆WATERPROOF & SECURE: Both the string of lights and the solar panel are waterproof, great for outdoor use. The crystal balls on the string pretty securely, enough to endure a wind storm, heavy rain. ◆SIZE and MODE: 20-feet wire with 30 LED string lights. The balls are about 1 inch in diameter and 6 inches apart each ball. This solar string lights with TWO MODES(Steady on/ Flashing) for choose. 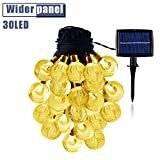 ◆PLEASE NOTE: All our solar string lights with a life time warranty and our friendly customer service. The time of string lights illuminate should be closely effected by the situation of local weather. fully-charged for 6-8 hours, then the string lights will automatically light up at night. 6-months warranty and our friendly customer service. Please feel free to contact us if you have any inquires.